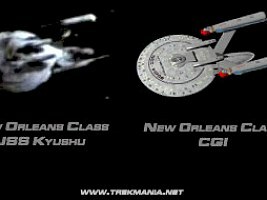 The New Orleans class includes the USS Kyushu NCC-65491, USS Renegade NCC-63102, USS Rutledge NCC-57295 and USS Thomas Paine NCC-65530. Only the Kyushu could be seen on screen, as part of the wreckage at Wolf 359 (image). It is the heavily damaged ship next to the OPS console and is also mentioned in the dialogue. 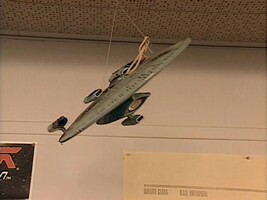 The ship was built by Ed Miarecki. 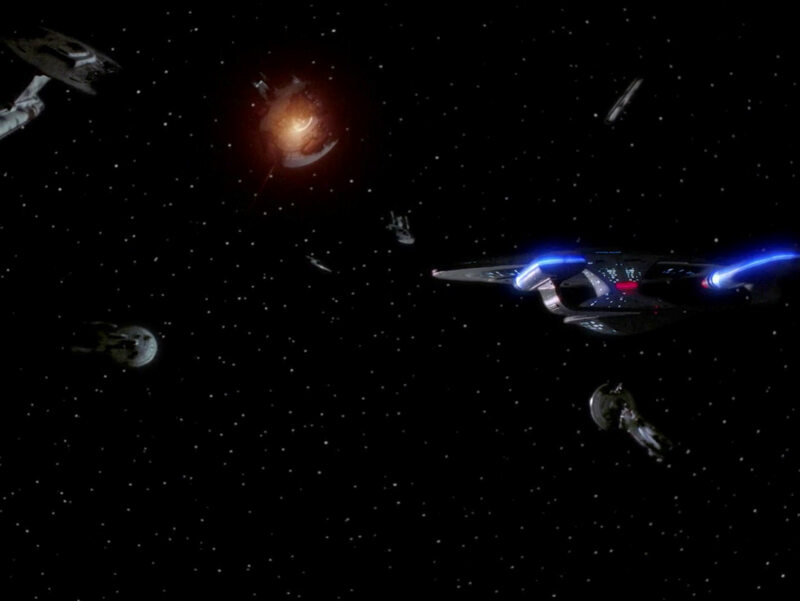 Since all the Wolf 359 ships are presumed to be composed of Galaxy parts, it was not completely clear if the ship on the left edge in the second scene is actually the New Orleans, or maybe rather the Cheyenne or the Springfield. 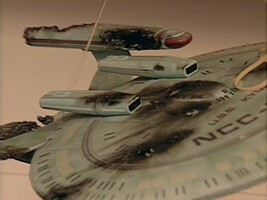 However, Chris found out that the damage pattern is identical to the one on the New Orleans model. 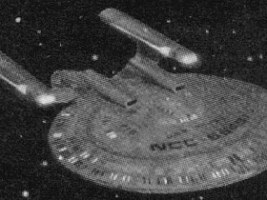 The first printed depiction of the New Orleans could be found in the Star Trek Encyclopedia I, but the small black & white photo only reveals that the ship looks similar to a Galaxy class, with different warp pylons and two additional pods on the top of the saucer. 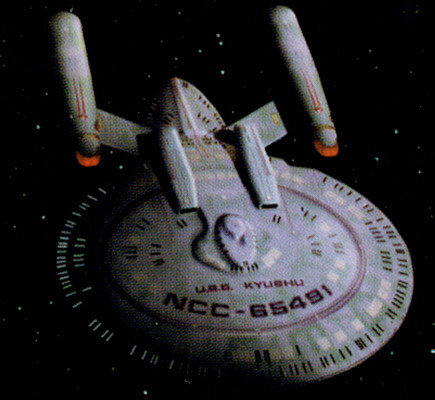 The Star Trek Encyclopedia II features two color images of the Kyushu, one top and one bottom view. 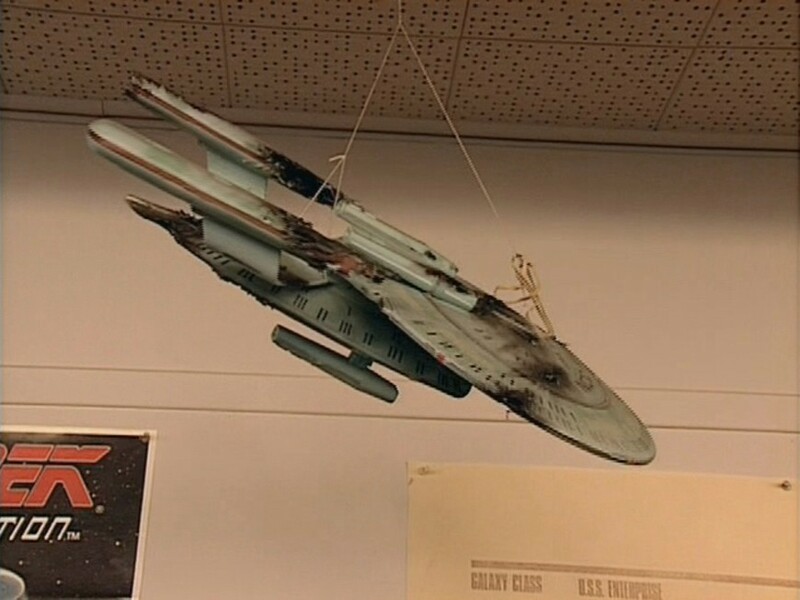 I previously thought it could be CGI reconstructions of the undamaged model of which there might be no photo at all. 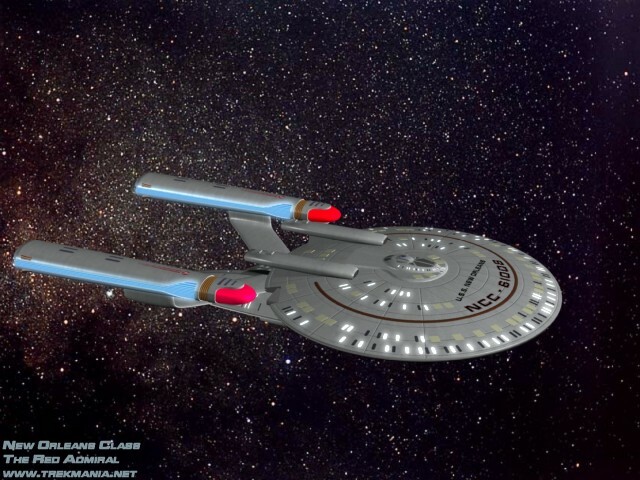 Considering the lighted windows, glowing nacelles and the artificial background, the image has obviously been manipulated. Still, some of the typical features of a real model become obvious already here. 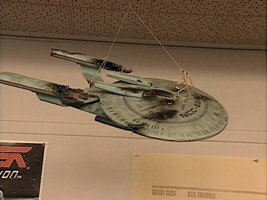 These are actually photos taken of the miniature just before Mike Okuda added the battle damage. 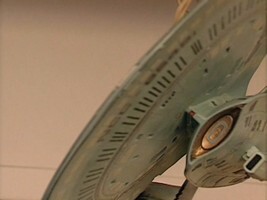 It becomes evident that almost exclusively Galaxy-class parts have been used for the model, yet with extensive modifications. Another New Orleans-class image was presumably first shown by Mike Okuda on a convention and has been retouched in the course of its dissemination, now sporting a black and blue star background. 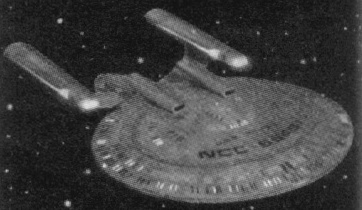 The best image of a New Orleans-class ship so far was featured in the Japanese book Star Trek Mechanics. 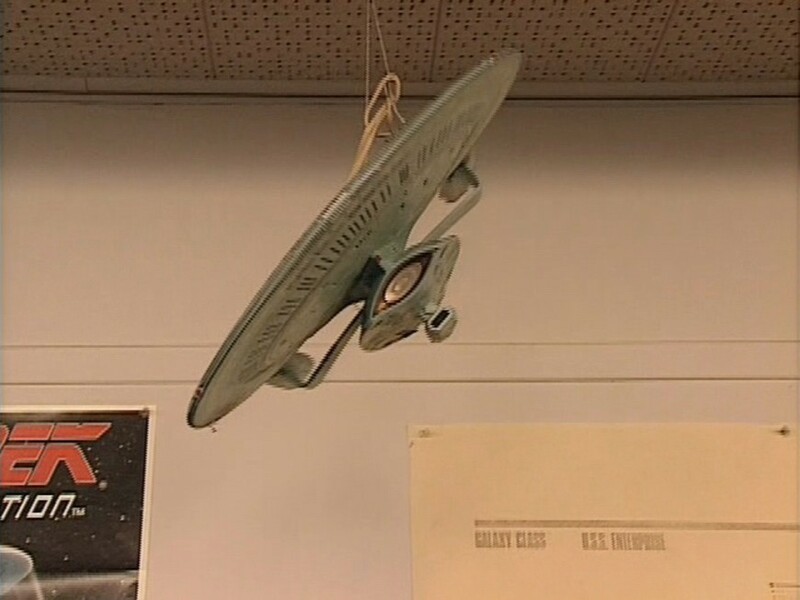 All reference images doubtlessly prove that a Galaxy-class saucer, engineering hull and nacelles form the basis for the New Orleans-class model. It would have been easier to modify the 1/2500 scale model whose surface is mostly flat, as it has been done for the Cheyenne class too. The relatively good detailing, however, of the phaser strips, windows and escape pods (image) insinuates that the model uses parts of the 1/1400 AMT/Ertl Enterprise-D. This has recently been confirmed by Ed Miarecki. A lot of differences to the Galaxy become obvious when we further study the reference images. 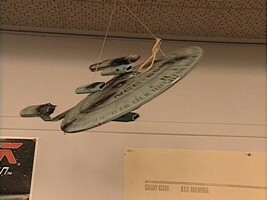 First of all it is obvious that the windows and lifeboats have been modified so as to suggest the New Orleans class is a significantly smaller ship than the Galaxy class. Generally, two decks were combined to one. This allows a first estimation of the ship's length which would be around 320m, half as long as a Galaxy class. 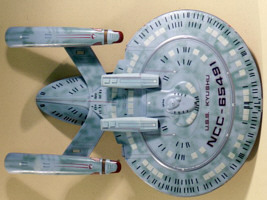 The New Orleans class sports two additional pods on the top of the saucer and one pod underneath the engineering hull. 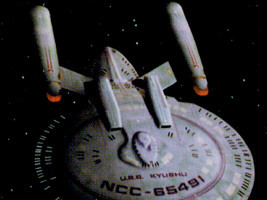 It is in dispute among fans whether these pods are supposed to hold auxiliary warp engines, photon torpedo tubes, sensor arrays or even shuttlebays, but this has to be clarified by the starship designer, provided they are intentional design elements at all. 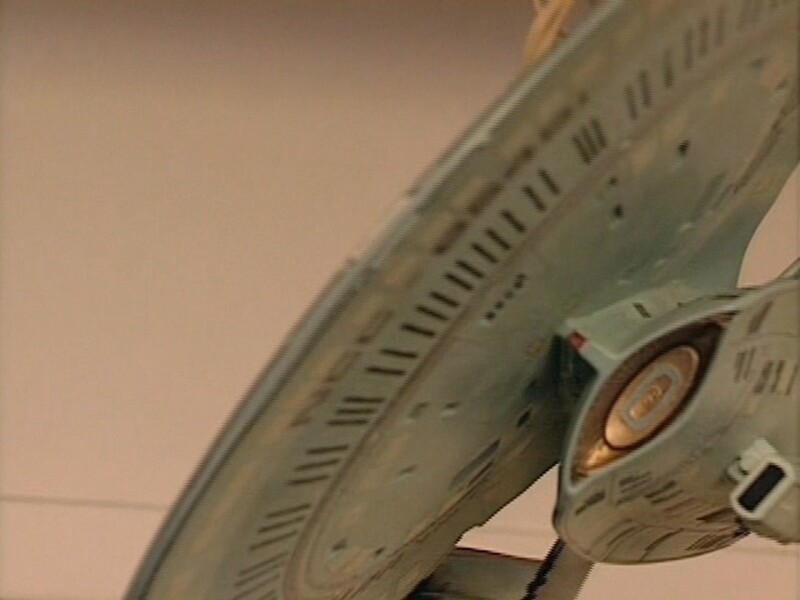 Considering the text marker nacelles of the Cheyenne class, the pods are apparently made of text markers (most probably from Schwan Stabilo) likewise, which would work perfectly with the 1/1400 Galaxy model kit. 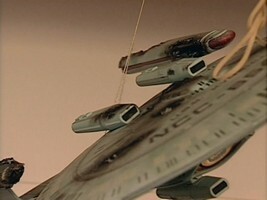 Since the model is based on the 1/1400 scale Enterprise-D, the comparably larger bridge is probably a custom-made part. 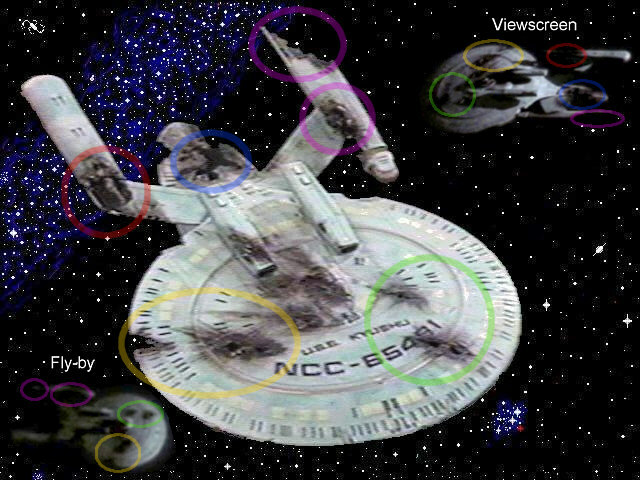 Note that deck 1 is just an ellipsoid (image), much less detailed than that of a Galaxy class at the correct scale. 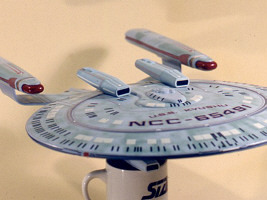 Nevertheless, the shape of the bridge module, including deck 2, clearly indicates that it is supposed to be the Galaxy-type module. This will be the basis of my final size estimation. 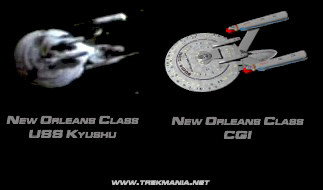 The top views of the New Orleans class do not look much different from those of the Galaxy class, except for the mentioned detail changes. 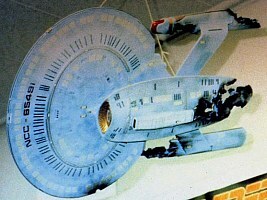 In contrast, the two bottom views in (image 1, image 2) show that, compared to the Galaxy class, the engineering hull is much closer to the saucer. This can only have been accomplished with a shortened neck. I assume that the lower end of the Galaxy neck has been cut off, and the center impulse engine attached again. The engineering hull has been significantly extended, either with a custom-made piece or a combination of two hull parts and lots of putty. This is confirmed by the existence of two phaser strips (image), one originally belonging to the forward and one to the backward hull piece. It also becomes obvious in a comparison of the top and the bottom views. The engineering hull front end is right beneath the saucer center, while its rear end is in the same place as it is on the Galaxy-class model. Moreover, the rear end has been modified and the undercut covered. 1. 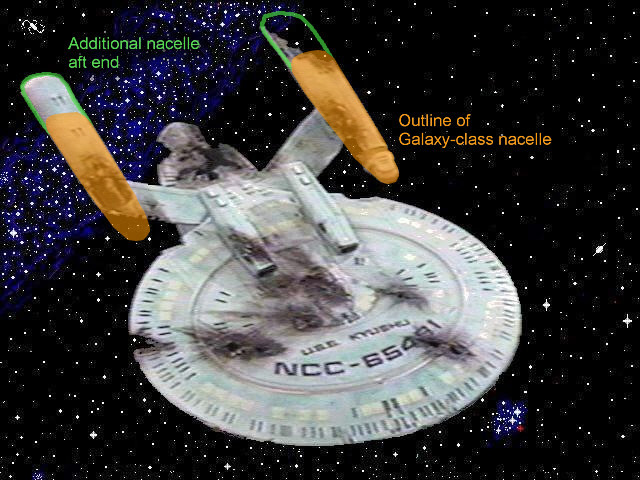 The two top views show apparently thinner nacelles than a view of a Galaxy-class ship from the same angle. It could be objected that this might be an illusion because a part of each nacelle could be shaded, but I doubt this would apply to both nacelles on both images. 2. 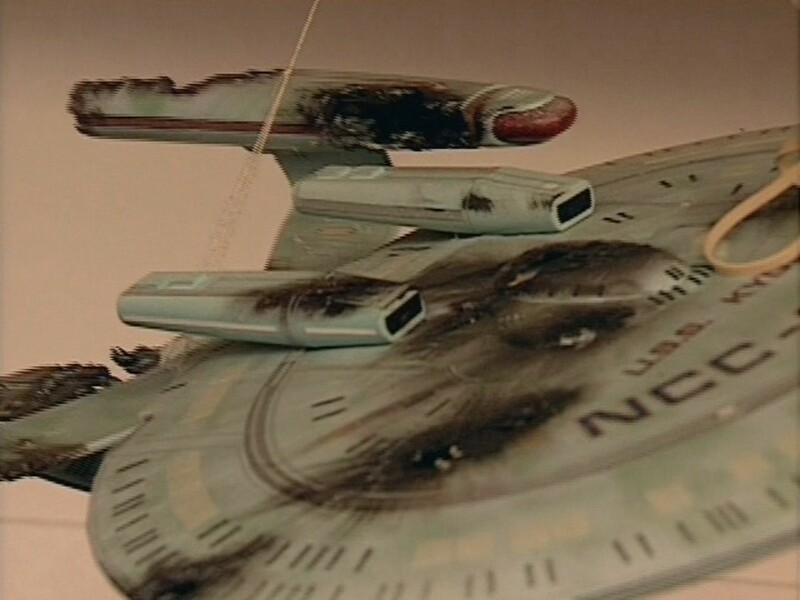 The nacelles of the damaged Kyushu model are apparently not as long as those of the intact models. Nevertheless, these images can prove my assumption as well. The complete Bussard collector section (front tip) of the starboard nacelle is missing (image), and the rest of the nacelle alone is as long as a complete Galaxy-class nacelle, unless the image was falsified when it was first retouched. 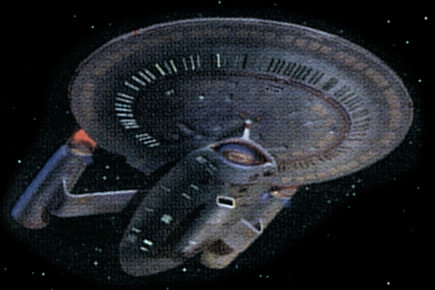 The port nacelle, on the other hand, is lacking the rear end, and the rest has about the same proportions as a Galaxy-class saucer viewed from the same angle. 3. 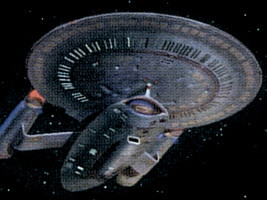 If the nacelles were nevertheless unchanged Galaxy class nacelles, they would not be of the same scale as the saucer, but somewhat larger. 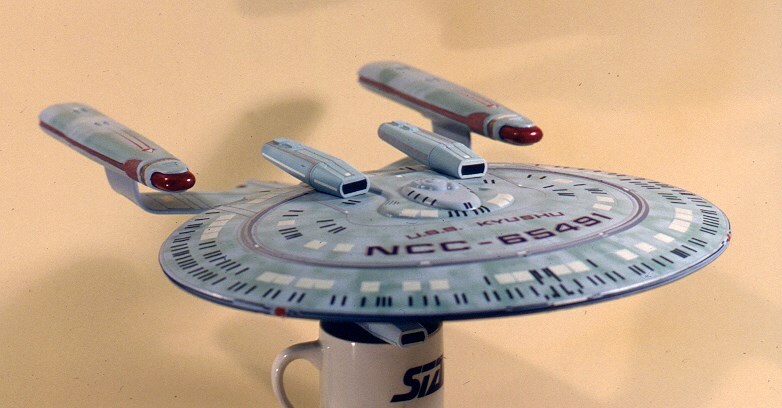 This is possible, but improbable, no matter if a 1/2500 or a 1/1400 model kit was used. 4. The top views in show two pairs of deepenings (plasma vents) in the nacelles, one close to the rear end and one about in the middle. The Galaxy-class nacelles, however, have only one pair. 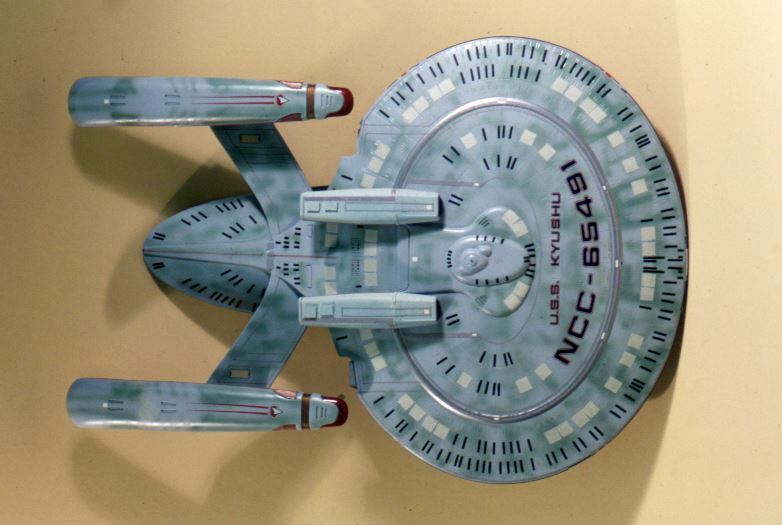 It is obvious that the far smaller New Orleans class nacelles are supposed to look different from the type used with the Galaxy class. This can be accomplished attaching another rear end to each nacelle, rather than scratching out two additional holes which would not be worth the effort. 5. 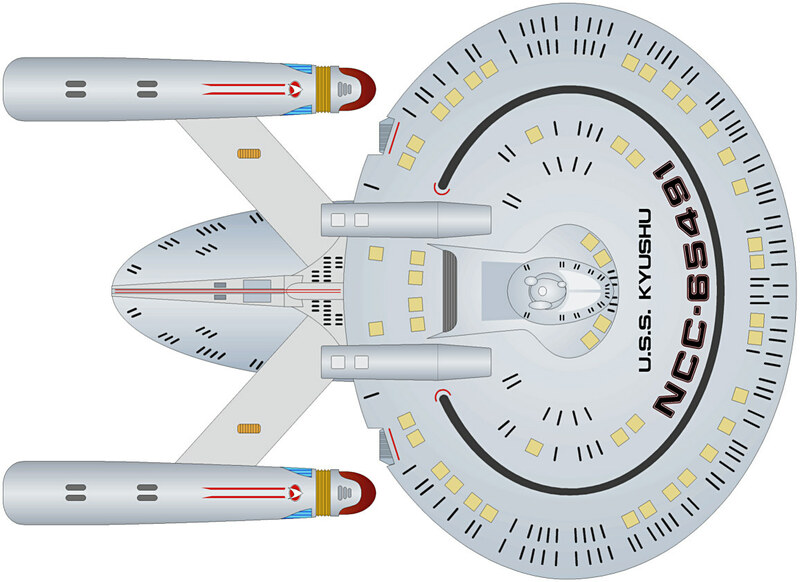 My reconstructed top view, based on the assumption that a second nacelle aft end has been attached, results in exactly the appearance of the nacelles as best seen here. This cannot be a coincidence. 6. Both top views show an area of different color between the two pairs of plasma vents, as if the putty is visible despite the overall paint coating of the model. Based on my side-view schematic, Masaki made a sketch of what was used to build the ship. 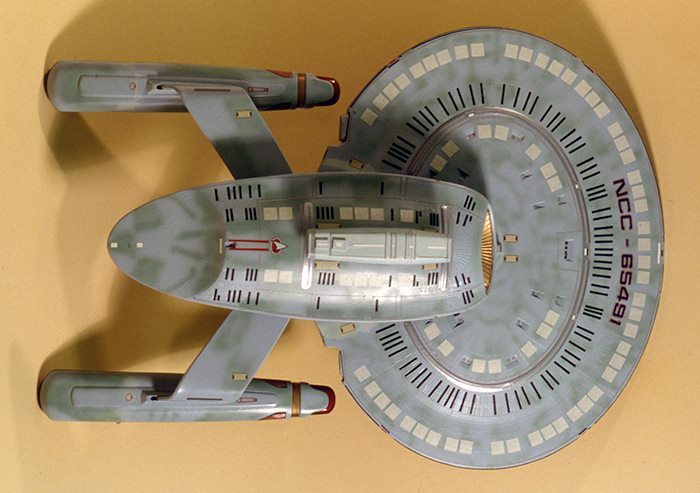 The Kyushu was built by Ed Miarecki using the AMT/Ertl 1/1400 Enterprise-D kit. He stretched the secondary hullby putting together two thirds of the front and two thirds of the rear end. He did something similar when he added another rear end to the warp nacelles. 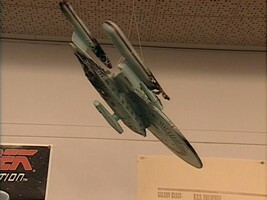 Thebigger bridge module is scratch-built, considering that there is no larger kit of the Enterprise-D. 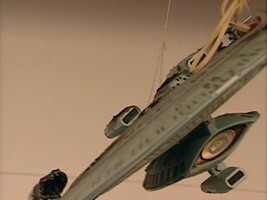 The three large "pods" were later added by Mike Okuda using marker-pens. More than three years after I wrote this article, we finally have a bunch of pictures available that show details of the Kyushu studio miniature. 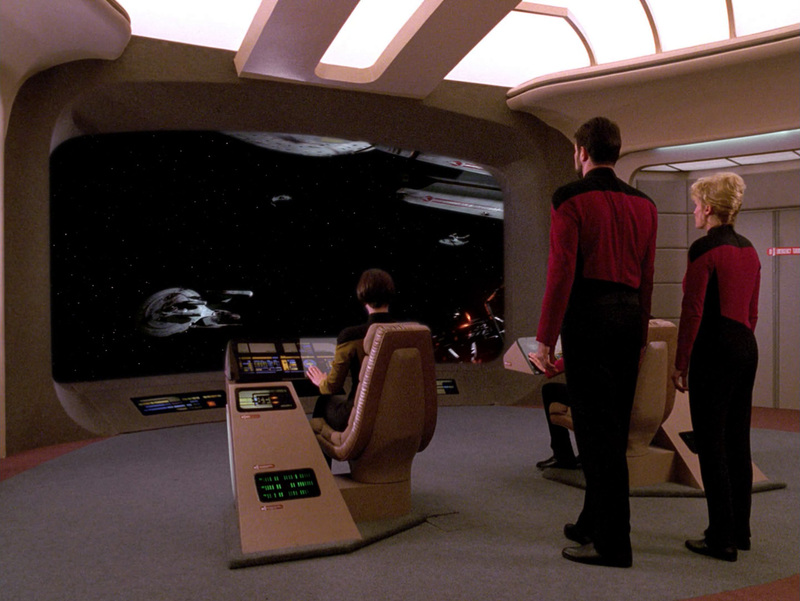 The following are screen caps from the TNG season 3 DVD. Enjoy! One observation is that, unlike we assumed so far, the single lower pod is not directly affixed to the engineering hull, but with a distance of about the pod height itself. 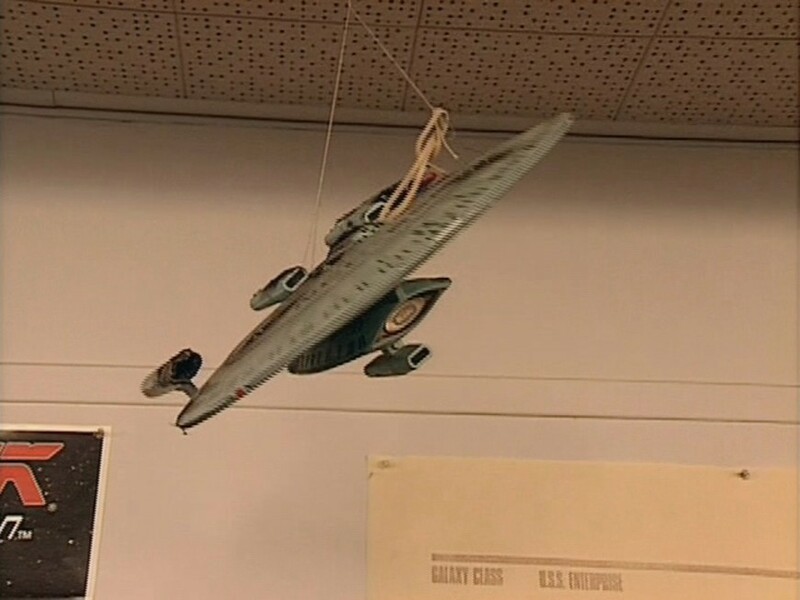 It also becomes obvious that, as seen from the side, the nacelle pylons are sloped backward and not exactly vertical. This is already corrected in my above side view schematic. In 2015 and 2016, Rick Sternbach managed to dig up several more photos of the various ships built by Ed Miarecki and used for the Wolf 359 shoots, all taken before the models were damaged. They include the first good pictures of the undamaged New Orleans class. 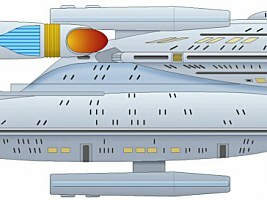 Given the known size of the Galaxy-class bridge module, the New Orleans class is 340m long and 246m wide according to my above diagrams. 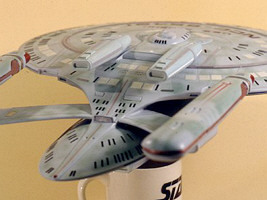 It is interesting that the saucer seems to be smaller than that of the Cheyenne (262m wide). The limited accuracy of my reconstructions would allow the interpretation that they are actually supposed to be the same at 1/1 scale. 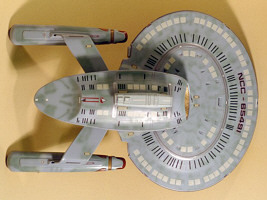 Yet, the Cheyenne miniature uses a 1/1400 bridge module on a 1/2500 Galaxy hull, whereas the New Orleans is a 1/1400 model with a custom-made bridge. It is rather unlikely that these size relations are exactly the same. So the saucer of the 1/1 Cheyenne, which is turned upside down anyway, can be supposed to be a different design with a different, slightly larger size. 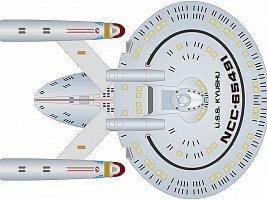 Although the New Orleans is probably smaller than it would be if the saucer were the same as of the Cheyenne, several decks seem to have a height of more than 4m each, provided the bridge module has two decks with the usual 3.5m height. The New Orleans-class escape pods being simple rectangles, they are not necessarily the same size as those of the Galaxy, so they are not a useful reference. My thanks go to Alexander DeLarge, Pedro, Frank Gerratana, The Red Admiral and Nick for image material. 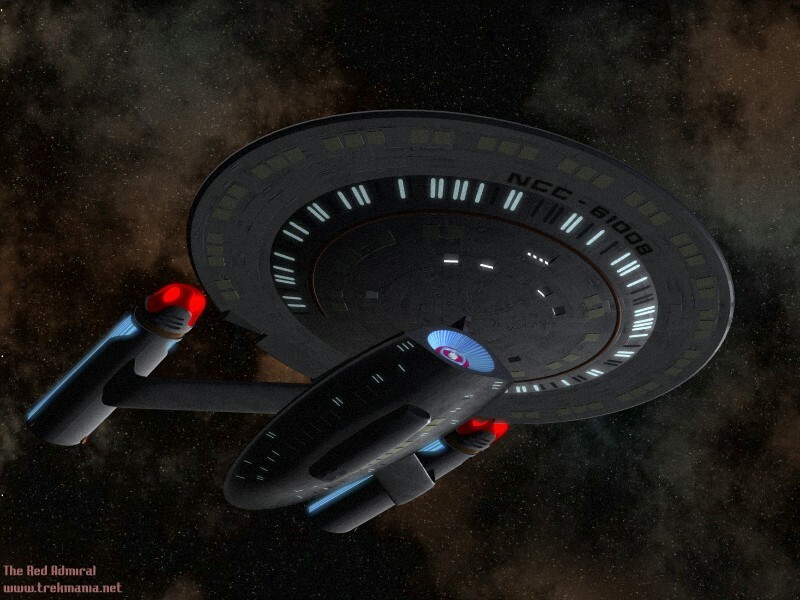 I also wish to thank Shipbuilder, Federation Shipmaster, The359, TSN, AndrewR, The Shadow, NeghVar, Sol System and The Vorlon at the Solarflare Forums who helped me to reconstruct the New Orleans class. Special thanks to Chris for additional comments and to Masaki for the illustration of the structural analysis. Big thanks also to Rick Sternbach!